For many years, I’ve offered Coping with Pain support groups. These sessions have both skill-building (learning exercises such as relaxation and visualization) and discussions on living with chronic pain (issues such as family issues, staying positive, working towards acceptance). Some patients find them so helpful, they attend more than 1 series. What are the benefits of these types of groups? Many people with pain lose work friends, and can’t do as much with friends and family. Pain can be very isolating. Groups can increase your socialization. Groups can help people realize they aren’t the only ones with significant pain – others in the group really understand your pain. You feel less isolated. Each person in a group knows ways to cope with pain. Sharing these can help others, and group members benefit from things others have learned. There’s less re-inventing the wheel to figure out how to cope with pain. Patients with pain often do less – at work, at home, hobbies, etc. They become the help-ee rather than the help-er, mostly receiving assistance. 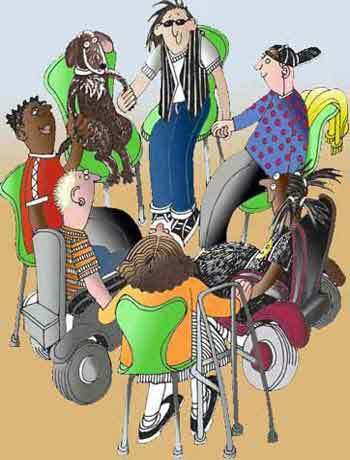 Helping others in support groups lets patients have more balance between helping and being helped. Helping others often increases self-esteem. As we said above, pain can be isolating. Adding new people to your support network can be good for you, to have other people to rely on. As well, this can lessen the load of those already in your support network, who may sometimes feel overburdened from the impact of your chronic illness. Living with chronic pain often means living with limitations and challenges – living a new type of life. Sharing resources, information, and tricks and tips is an advantage of a group. One important challenge of a group is to keep it focused on coping with pain. Groups should not settle into complaining, focusing on pain, or focusing on whose pain is worse.